Leaning toward IPD for your next project? Read this first. DPR Construction’s Joel Darrington knows construction contracts inside and out. His knowledge of Integrated Project Delivery and how to structure a construction contract for IPD success is highlighted in a chapter in 2018’s German language Lean Construction – Das Managementhandbuch. His analysis and recommendations–in English–are available in a new DPR case study. Q: What’s a good analogy for why customers shouldn’t just take a shot at IPD without thinking about contract structure? Darrington: Let’s compare building a successful construction project to developing a successful basketball team. Successful construction projects and basketball teams need talented, hardworking people who will perform their assigned roles well. But, imagine if you took the Golden State Warriors and required them to play with rain boots and overcoats. The clothes would get in the way, diminishing their performance and, potentially, causing them to lose more games. In construction, the right kind of contract is like having the right outfit for basketball. Project team members may be talented, hardworking, and know what to do, but find that the wrong kind of contract gets in the way of achieving success on the project. Many project teams are trying to improve outcomes by being more collaborative and deploying Lean principles and techniques. We find, however, that traditional construction contracts are frequently getting in the way of integration and Lean behavior. 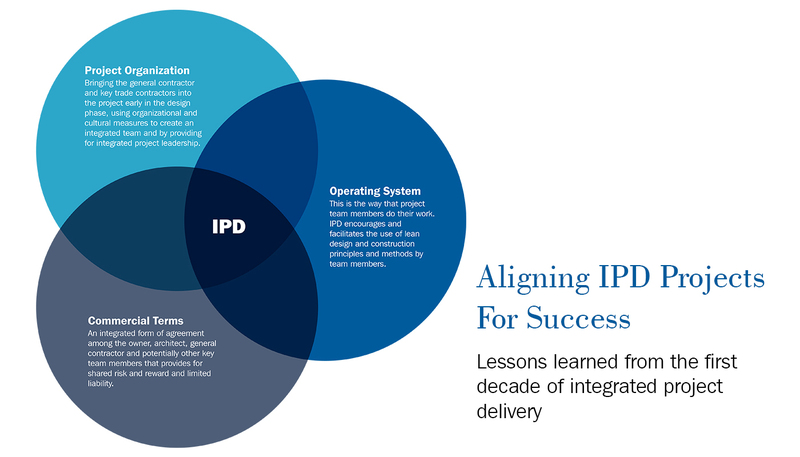 IPD contracts were specifically developed to remove a traditional contract’s impediments to integrated, Lean performance and build in provisions that support those aims. Q: What do you hope people will take away from this information? Darrington: That when it comes to the risks that are most likely on a project (overbudget, behind schedule, quality problems), implementing IPD with a supportive contract is less risky than using more traditional contracting approaches, provided that you have the right team members involved with the right level of commitment and mindset. By structuring a project’s contract, operations, and team leadership in a more integrated, Lean way, projects are more reliably able to achieve success for all involved. That’s why every stakeholder should take a keen interest in the contract itself. Q: How do you feel IPD will move construction forward for all stakeholders? Darrington: As word gets around about projects that experienced the benefits of Lean Construction, more projects will start exploring Lean principles and methods. More and more evidence is showing that Lean project delivery is best implemented in an IPD environment, so IPD will also grow as a project delivery model. We’re already seeing that IPD can influence project delivery even when projects do not adopt an IPD agreement, advancing Lean Construction principles and methods. This increase will eventually reach a critical mass and result in improvements in industry metrics around labor productivity, schedule performance, quality, budget performance and even safety. When that happens, owners successfully implementing IPD will be able to do more with their capital budgets or be able to re-deploy capital to other enterprise needs, driving more economic growth. At the same time, contractors and designers adept at implementing IPD will enjoy competitive advantages, have more reliability in achieving profit goals, and have less fee erosion due to performance issues and project disputes. It’s a win all around.